After this election we need your help more than ever! 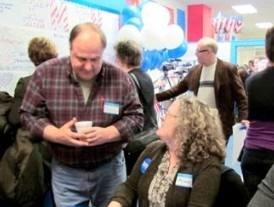 Now at this pivotal moment in history, we can all play a part in the success of the Democratic Party in DuPage County. Whether you’re inspired by a sense of pride, a commitment to community or a feeling of camaraderie and accomplishment that comes with working toward our common goals, your gift of time, energy and enthusiasm is incredibly valuable to the Naperville Township Democrats. We hope that it will also be valuable to you as a rewarding experience and a way of connecting with your community. Would you like to work with the us as a Democratic Volunteer? There are a number of ways you can become a key part of the organization. Whatever your talent or interest in local politics or government, we have a spot where you can make a difference. Responsibilities include setting up and working on phone banks or door-to-door canvassing neighborhoods or engaging voters at train stations, stuffing envelopes, creating and stapling literature together. Responsibilities include setting up and maintaining a database of member information, list management, input, organizing, and analyzing information gathered from phone banks, walk lists and voter activation networks. Responsibilities include researching policy initiatives, writing policy briefs and making policy recommendations. Responsibilities include planning fundraising events, donor outreach and follow up, and basically building relationships and exploring new fundraising techniques and ideas. Responsibilities include running and providing content for our Facebook page and other social media. Responsibilities include interacting with and offering support to people and organizations in the community, including candidates, unions, business and social organizations, charities and neighborhood voters. Responsibilities include communicating with, connecting with, and engaging voters with the goal of growing the Democratic Party and the Naperville Township Democrats membership, using tools like advertising, public relations, social media and other media production to get our message out. ASK ABOUT BECOMING THE ULTIMATE VOLUNTEER – A PRECINCT COMMITTEE PERSON!